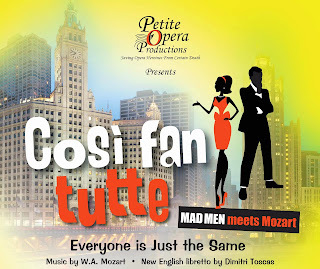 Audiences are in for sheer madcap fun with this updated Cosi fan tutte. Dimitri Toscas' new libretto is nothing short of brilliant. Written by Mozart in 1790, Cosi fan tutte is a comedy that centers around a bet on fidelity made by the three male characters. The driving force of the bet is Don Alfonso (bass-baritone), a man who is cynical that any woman can be faithful. He bets two soliders, Guglielmo (baritone) and Ferrando (tenor) that their girlfriends--sisters Fiordiligi (soprano) and Dorabella (mezzo)--will not stay faithful to them if the guys leave town for even a day. The guys take the bet, believing their girls will never stray, and come back in disguise to woo the girls as completely different characters. Alfonso works his scheme aided by the girls' maid, Despina (soprano). Unknowingly, the girls fall for the switch, and fall for the "new man". Creating a Chicago Premiere involves some careful selection to make certain the "recipe" is just right. "The original Mozart/Da Ponte opera is wonderfully written, the interplay and music are fantastic, and it utilizes a small ensemble cast, which is in line with our "petite" mission, said Susan Baushke, Petite Opera Executive Director. "While the show was definitely in our sights for selection, we worried about producing the original since it requires too much suspension of disbelief for today's novice opera patron: How could the girls would be so woefully incompetent or gullible as to not see through the guys' disguises? As a result, we were delighted to secure Dimitri Toscas' updated version, set in 1959 Chicago. Here, the girls see through the disguises immediately, completely turn the tables on the guys, and teach them a lesson about betting on their fidelity!" Toscas, told Petite Opera that he never envisioned that Mozart would actually have presented the girls as totally duped by the guys' disguises. One of his motivations for writing the piece was to truly present that both men and women respond the same way to these little games. Ergo, the change in focus and translation from "Thus Do All Women" or "All Women Are Like That", to "Everyone is Just the Same". This shift comes out clearly in the update. In addition, the show has been shortened to about 2.25 hours from its original 3.5 hours. The chorus has been removed, and there has been some creative musical editing--moving musical selections around to accommodate the updated action. The length appeals more to the audiences of today. Over the next several posts, we’ll hear more from Petite Opera staff and cast on the making of this incredible Chicago Premiere. 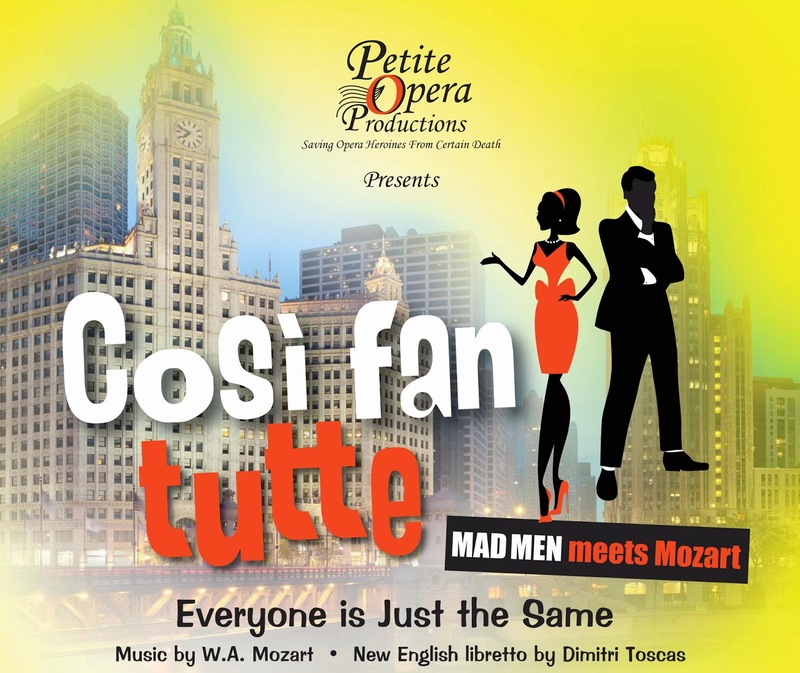 Petite Opera performs Cosi fan tutte (Everyone Is Just the Same) November 8-23, 2013 at Mary Wilson House Beyer Auditorium, part of St. Mary's Episcopal Church campus, 306 S Prospect Ave at Crescent Ave (enter on Crescent Ave), Park Ridge, IL. Call 847-553-4442 to reserve tickets, or purchase tickets online via credit card (convenience charges apply to credit card orders).